This quintessentially North American holiday occurs every winter on February 2. Scholars credit the holiday to roots in superstition derived from the weather lore of the Pennsylvania Dutch, which arose from the German tradition of marking Candlemas as “Badger Day.” Roman Catholic and German Protestant religions used the weather of Candlemas to predict the onset of warm weather. Common misinterpretation of the term Grundsaudaag or Grundsow Dawg sounded more like groundhog than badger. As in many instances, the dominant culture absorbed the minority celebration, put its own spin on it, and--in this case--turned an old superstition into a fun holiday. The first known recorded observance of Groundhog Day is found in the 1840 diary of James L. Morris of Morgantown, Pennsylvania which is located in the heart of Pennsylvania Dutch country. The little known holiday made the newspapers for the first time in 1886 in the Punxsutawney Spirit of the city of Punxsutawney which holiday enthusiasts consider the epicenter of this rodent-based tradition. Only after journalistic mention did Groundhog Day receive its first official observance in 1887. 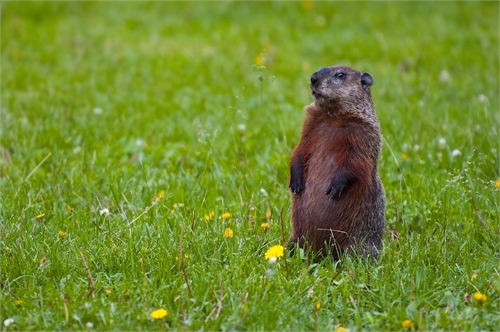 A large rodent, the groundhog--commonly called a woodchuck or whistlepig, too--lives in underground burrows. Native Americans and European settlers hunted it for meat and fur. Subsisting primarily on a herbivorous diet, groundhogs grow to 16 to 20 inches long, including a 6-inch tail and can weight up to 12 pounds. They prefer to locate their burrows in open country or at the edge of wooded areas. In captivity, they can live up to 14 years. So, what is Groundhog Day? As the superstition goes, if the groundhog pops up from hibernation on February 2 and sees its shadow, then spring will not arrive for another six weeks. Of course reality debunks that superstition, because the spring equinox doesn’t arrive until March 20, which is almost seven weeks after February 2 anyway.